Here you can find links to various photo sets and associated models of fossil tracks. All datasets are hosted on FigShare, and have associated DOI’s, so are citable as “Falkingham ,.” If you have any questions about how to cite, just shoot me an email. Description: Large tridactyl track attributed to a Tyrannosaurid trackmaker. Preserved in highly weathered surface. Manning PL, Ott C, Falkingham PL (2008) A Probable Tyrannosaurid Track from the Hell Creek Formation (Upper Cretaceous), Montana, United States. PALAIOS 23: 645-647. If you use this model, please cite that paper. Description: A pretty poorly preserved tridactyl track, probably theropod (but could be ornithopod). Loose boulder on the beach, heavily weathered. Notes: Found during field trip for SVPCA 2014 conference. Description: Historical photographs, and associated photogrammetric reconstruction of the famous Paluxy River Chase Sequence. Photographs were taken around the time of the excavation in 1946, and are scanned in at about 1200dpi. Notes: This reconstruction was described in: Falkingham P.L., Bates K.T., and Farlow J.O. 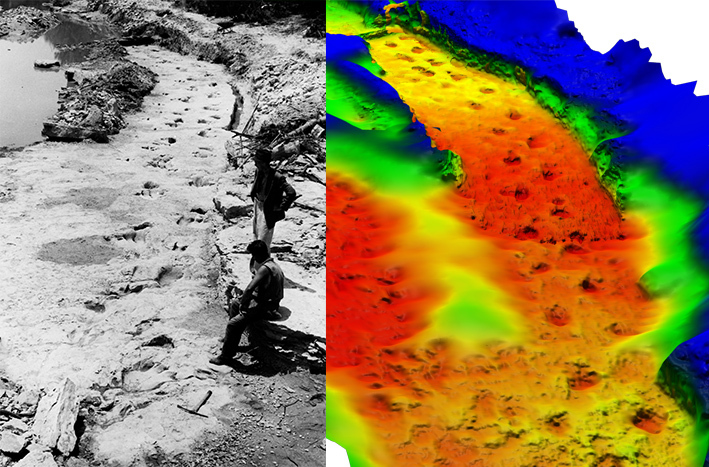 (2014) Historical Photogrammetry: Bird’s Paluxy River Dinosaur Chase Sequence Digitally Reconstructed as It Was prior to Excavation 70 Years Ago. PLoS ONE 9(4): e93247. The data is also available as part of the Historical Photogrammetry Challenge! Description: Theropod track, decent size, nice preservation. Used as an example track in Falkingham et al 2018.